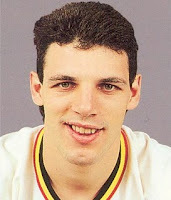 On May 17th in 1995, Gino Odjick of the Vancouver Canucks attacked all five St. Louis Blues skaters in the third period of Game 6 of the Western Conference Quarterfinals in response to Glenn Anderson spearing Pavel Bure in the eye earlier in the previous game. The Canucks lost the game that night 8-2 but won the series 4-3. * See also Today In NHL History - Odjick's Penalty Shot.